2 What is so Great About Choosing the Best Electric Air Compressor? Electric compressors come in different sizes, capacities, styles and performance. If you are serious hobbyist or perhaps a professional, there are heavy-duty electric-powered compressors you can choose from. If you are a DIY guy who loves to tinker with a lot of nothing in and around your home, there are smaller devices available for lighter applications. You can either choose a stationary or portable one. Electric air compressors are probably the most popular types available for many different reasons. They are more convenient and easy to use aside from the fact that they are more affordable. If they are cheaper, can you get the best one out there? Cheap doesn’t mean less desirable or less efficient and expensive doesn’t necessarily mean it’s the best on the market. It always boils down to its utility – where you are going to use it or the types of projects you are going to be working on. What is so Great About Choosing the Best Electric Air Compressor? You have your own valid reasons why you choose an electric type over other types – perhaps similar to other users who go for electric-powered compressors. Why not, it offers a lot of benefits while making things easier for you to complete. Among the types of air compressors, an electric type is the most affordable. It can be powered directly through an electrical outlet or plugged into a vehicle’s cigarette lighter socket. You may also connect directly to your vehicle’s battery or hook up to your car’s electrical system. It doesn’t release toxic fumes like gasoline-powered ones so you can use it inside your home. Softer sound output so you can do your tasks even when the entire household is sleeping soundly. It can be used on various applications such as inflating tires, toys and sports equipment. Some are designed for pneumatic tool use while others are made for professional applications. How to Find the Perfect Electric Air Compressor for Your Home? Finding the best electric air compressor means being fussy about the price, technical aspects and utility. Everybody wants a great deal on their purchases, right? So, to get the right air compressor for your various projects at home, understand and learn what to consider. Don’t jump the gun until you have identified your needs. Are you considering a stationary or portable type? Are you going to use it for your pneumatic tools? What kinds of tools are you going to use it for? Do you intend to use it for lighter tasks only? You should be able to answer these questions before going into the details of buying your compressor. Air compressors have what you call PSI, CFM, HP, etc. Are you familiar with these terms? If not, do your homework and find out what these mean. These are vital considerations when looking to buy your electric compressor. Depending on where you are going to use your tool, the numbers should correspond to the applications. Otherwise, you may not be able to benefit from its utility. Why buy something you hardly can afford. Well, if you are going to use it on a day to day basis, why not? Otherwise, stick to your available resources. Electric air compressors are affordable and you can have one under $100. 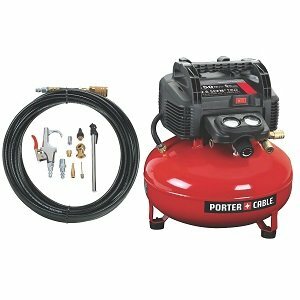 For simple tasks such as inflating or occasional home improvement tasks, an inexpensive but high-quality electric compressor is reasonable enough. Product reviews and feedback from independent reviewers and verified users are reliable resources. If you are not well-versed about air compressors and you want value for your money, you can get a tip or more from these reviews online. Weigh the pros and cons and come out with an informed decision. If you are looking for a portable compressor that can help you with your various home upgrade projects, the Makita MAC700 can definitely deliver. This 2.6 “Hot Dog” gal capacity air compressor is equipped with a 2.0 HP engine for tough job site conditions. MAC700 runs cooler and at half the RPM of most competitive units, resulting in greater motor and pump life and lower noise. On top of that, oil drain and oil sight glass conveniently located for easy access and maintenance. Technical specs wise, its 3.3 SCFM at 90 PSI can operate various finishing nail guns or a framing nail gun. Slightly more expensive than the Rockworth model, this is also a perfect choice when looking to buy a multifunctional electric air compressor. You can use it to inflate or for pneumatic tool use. The Porter-Cable C2202-WK is maintenance-free with its oil-free pump but definitely powerful. It comes with a 6-gallon pancake tank and runs a maximum 150 PSI tank pressure for extended run time. Its 2.6 SCFM at 90 PSI provides fast compressor recovery time. Easy to carry around and easily starts even in cold weather due to its low-amp 120-v motor. If it meets your preferences and requirements regardless of its price, then you can say that it is the perfect tool for you.